Some parents may assign kids chores that are specific tasks, such as sorting recyclables or sweeping floors. Others may have children help out with whatever needs to be done. As a general rule, younger grade-schoolers need more supervision while older kids can handle multiple household tasks on their own. Whatever kids' chores you decide to assign to your grade-schooler, try to tailor it to her abilities, and what she wants to do. Giving kids chores boosts their self-esteem, teaches them the importance of having a job and finishing it and teaches them responsibility and the importance of keeping things clean and organized, among other benefits. This list of some age-appropriate chores for kids may help you as you consider what jobs your child may be able to handle. Also try to include your child in bigger tasks, like shopping for groceries. 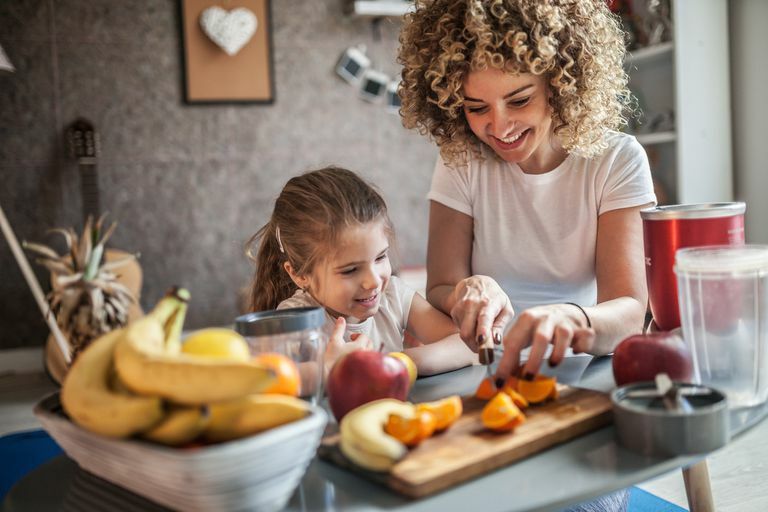 This can be an excellent opportunity to teach him about making healthy food choices (he can help you pick out fresh fruits and vegetables and decide what to make for meals). It can also be a great way to teach him about money and household budgets -- an especially important topic for families in today’s economy. Kids want to help. Take advantage of this natural desire, and encourage her excitement about doing kid chores. Don't force your child to do something she doesn't want to do; instead, make it fun and alluring so that she'll want to do it. Rewards and incentives are also a great way to get kids to want to pitch in. For example, you can tell your child that she can get a star for every chore she finishes, and at the end of the week, she can choose a family activity for everyone to do for an entire hour on the weekend. If he says he's bored, it may be because young children often have a short attention span. He could also be having trouble doing the chore as well as he wants to. Ask him if he’d like to do the chore with you or let him switch off to something else that's equally challenging and not too easy. Get her input on what chores she'd like to try. If it's something too difficult or dangerous for her age, come up with an alternative. For instance, if your child is too young to chop vegetables but she wants to help cook dinner, she can tear lettuce for a salad or measure and mix ingredients instead. Make chores for kids fun. When we clean our house, we crank up some rock music to get us motivated. Not only does it get us moving, but it also makes even scrubbing the toilet a whole lot more fun. Give him lots of praise. At first, your grade-schooler will probably make a mess or not do it right. But rest assured -- he’ll get better with time and practice. This is one investment that will pay off in the long run when your child is a young pre-teen or teenager who pitches in and shoulders a lot of the household chores. As with so many things in parenting, you’ll get what you put in. By taking the time to help your young child get into the habit of helping out around the house, you'll set a pattern that will benefit you both as he grows up.